Home » Academics » Schools » Greehey School of Business » Faculty » Violeta Diaz, Ph.D.
Violeta Díaz is Associate Professor of Finance at the Greehey School of Business. 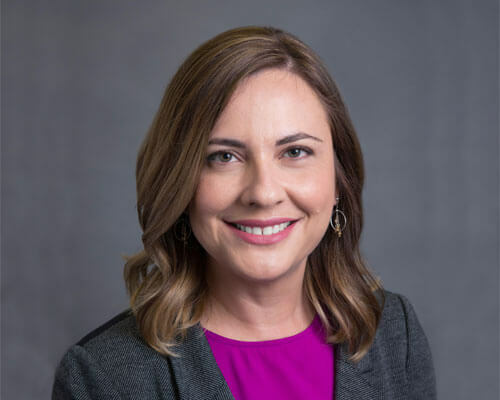 Prior to joining St. Mary’s University, she was Assistant Professor at New Mexico State University for five years where she led the banking program, and taught varied undergraduate and graduate courses. Before earning her Ph.D. in Finance from The University of Texas-Pan American, she taught at Monterrey Tech in Monterrey, Mexico. Díaz’s teaching experience is broad; she taught Economic Principles and International Economics at Monterrey Tech, and Econometrics, Business Forecasting and Financial Markets and Institutions at the University of Texas-Pan American. More recently she taught Investments, Corporate Finance, Banking and Financial Management at New Mexico State University. She is currently Visiting Professor at Bergamo University in Bergamo, Italy where she teaches Advanced Financial Markets and Institutions every winter. Her current research interests are in corporate finance and financial intermediation. She has eight scholarly articles, published in peer-reviewed journals, and her research has been presented at numerous academic conferences including the Financial Management Association and the American Economic Association. She was awarded the Outstanding Junior Research Award in 2014 at New Mexico State University, and the Best Paper Award at the Southwestern Finance Association meeting in March 2016. Díaz is passionate about teaching and being a good role model not only to her students but also to her two lovely daughters. Diaz, V., Huang, Y. (2017). The Role of Governance on Bank Liquidity Creation. Journal of Banking and Finance, 77, 137-156. Diaz, V., Hales, A. D. (2015). Issuing Level 2 vs. Level 3 ADRs: Do Country Characteristics Matter? Journal of International Business Research, 14(2), 67-74. Sankaran, H., Diaz, V., Espinosa, S. (2013). The Structure and Estimation of Bi-National Bonds as a Mechanism to Finance the Strategic Infrastructure in the US-Mexico Border Region. Journal of Structured Finance, 19(2), 71-88. Diaz, V., Soydemir, G. (2013). Regional Foreclosures and Mexican Remittances: Evidence from the Housing Market Crisis. North American Journal of Economics and Finance, 24(1), 74-86. Diaz, V. (2012). The Effect of Liberalization on Banking Efficiency: Evidence form the Five Largest Banks in Mexico. North American Journal of Finance and Banking Research, 6(6), 27-38.